WARNING: Prepare yourself for my sappiness. Considered yourself properly warned. My love for PanAway began due to my love for a man. It is true! Now, you should know that when I opened my Premium Starter Kit, that this was NOT my favorite essential oil. I was definitely all about the lavender, but that's probably because I am more of a delicate flower, overly cautious, and anti-exciting person anyways. I really think that exciting stuff is making DIYs. I'm happy with that. It's funny how the girl who thinks roller coasters are too big of an adrenaline spike is enjoying life with a man who jumps out of airplanes for fun and runs into a burning building for a profession. Go figure!! Life is funny like that, right?! It goes back to that theory of how we always look for balance in everything! Which are why essential oils are so great-- they help take care of him after his crazy adventures! Sometimes I question my intelligence. I have been trying to figure out a DIY dish soap recipe for months. MONTHS! I've been shaving down bars of soap, melting them, and then adding all these amazing ingredients, but then it ends up becoming a weird pile of goop. I've tried everything and NOTHING WORKED! Until now. This recipe is seriously so simple that I'm really ashamed that it's taken me this long. Are you ready for this one? It might blow your mind cuz it's soooooo easy!!!! 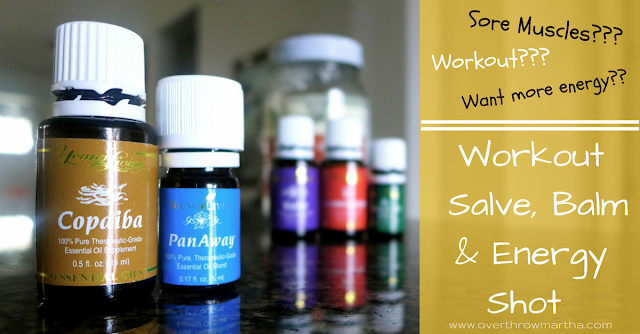 I add the salt to your soap dispenser or bottle, then add the essential oils and shake the jar to mix them together. 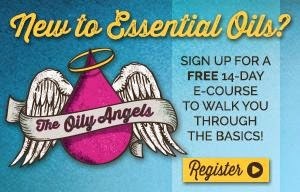 FIY: Adding the salt to your essential oils helps prevent that whole "water and oil don't mix" thing. They will still separate a little, but not nearly as much. Next, add the water-- shake, shake, shake to get the salt dissolved. Add the vegetable glycerin and castile soap-- give it one good shake and you are ready to get scrubbing! TIP: This works best when NOT added to dish water, but rather put in a small dish and you dip the sponge into it to clean the dishes individually. I gotta say that I'm pretty impressed with myself. If I have a particularly greasy item I'll just squirt a little directly into the grease and scrub-- it easily has come off for me every time! The vegetable glycerin also helps it to be gentle on skin, too! 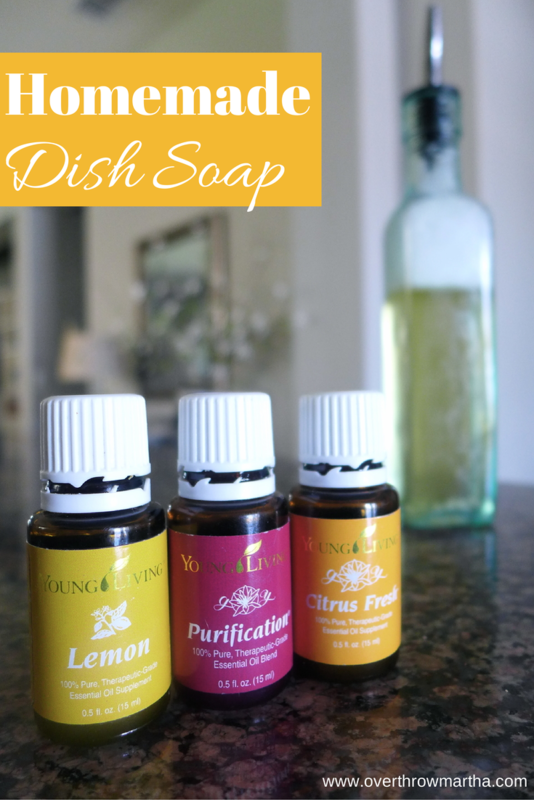 My favorite essential oils to use for dish soap are Lemon, Citrus Fresh and Purification because they smells fabulously and they clean really well! I really like Lemon because of it's strong degreasing properties. I'll add other essential oils into the mix for better cleaning-- Citrus Fresh can help remove grease and grime from dishes, and Purification removes odors and disinfects as it cleans. Lately, I've been really liking Citrus Fresh, Purification and Lemon together. It smells so fresh and so clean clean! But if you aren't a fan of citrus, you can use peppermint, lavender, Thieves, tea tree, pine or any other essential oil which is typically used in cleaning products, too. It's a lot of fun to create your own signature scent even for dish soap!! 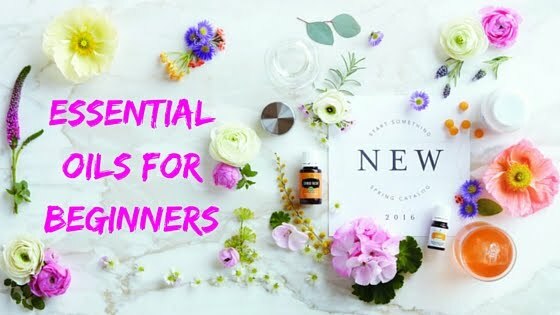 If you'd like more information about essential oils please visit this post or if you'd like to join my Natural Living Support Group on Facebook please fill out this form! 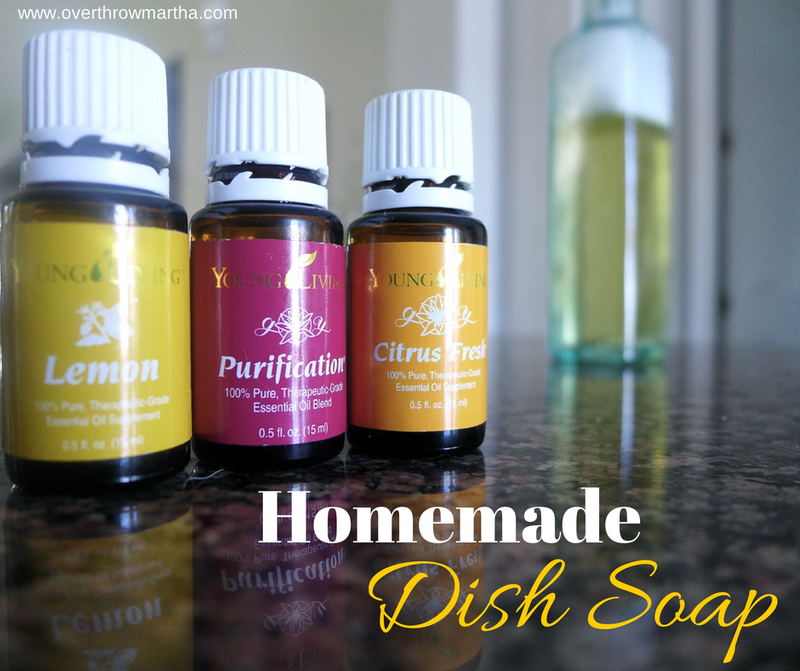 I can't wait to hear what you guys think of this DIY dish soap recipe! I hope you like it!! Are you looking for Hand Soap? Try this recipe! I looooove it! I have a thing about scents: I loath bad smells and I'm obsessed with good ones. This has absolutely been an issues since I decided to become chemical free because most air fresheners are toxic. The other side of this story is that I live with a firefighter, a dog, and three cats so.. yeah, things can get smelly! Back in my before-I-knew-better-days, I used to have those scented plug-ins all over my house, but I ended up with some nasty headaches so I stopped using them and then I moved to those spray air fresheners before I realized what's actually inside of them!! 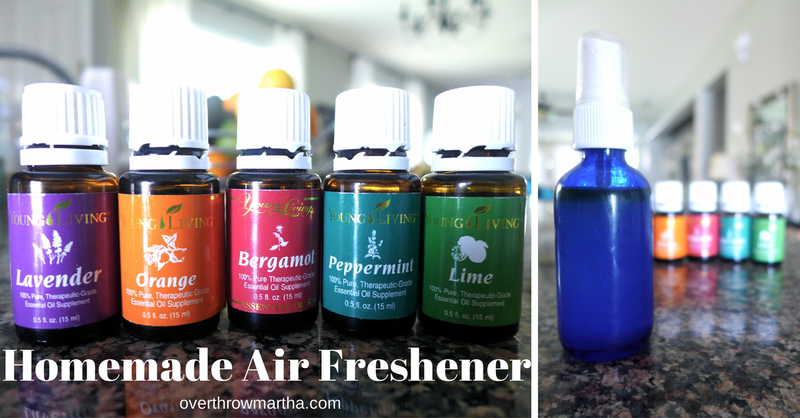 Go look at your favorite air freshener on EWG and see. It's a little disturbing. Or a lot. Okay, probably a lot. Just go look!! After that, I replaced them with an aromatherapy diffuser which has been amazing and so many people have complimented me on how great my home smells which makes me soooooooo happy. But if you know me, then you know I WANT MORE!! I wanted something to remove odors! 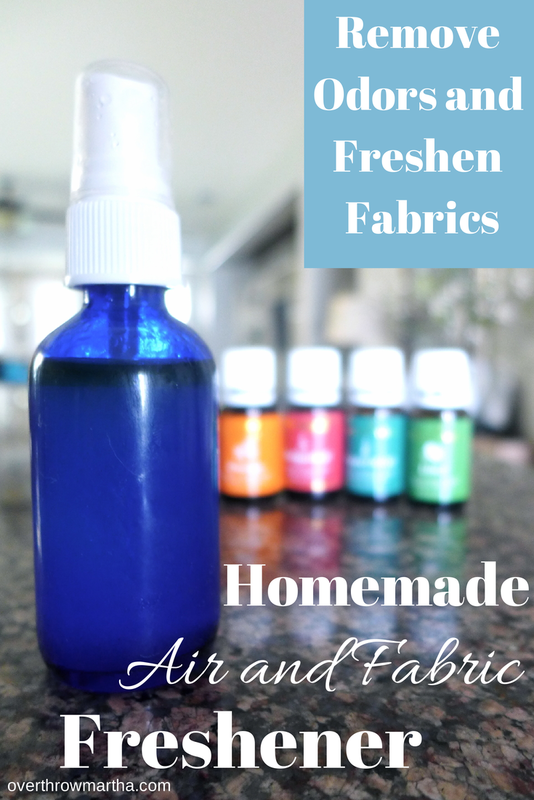 I already use my DIY carpet freshener which is great at removing odors and deterring bugs, but I wanted to make something to spray on my sofa, chairs, curtains and other items which were laying around the house, but were a lot harder (or impossible) to toss in the washer. Plus, it's difficult to move the diffuser to an office and it's impossible to use in the car. I can easily carry this spray bottle in my purse anywhere I go. I normally use Lavender, Peppermint, and Bergamot, but lately I've been wanting a smell that is more citrusy for summer so I added some orange and lime to keep it more in the season! Feel free to experiment and have fun! It's a blast making your own custom scents. You never know what you're going to absolutely fall in love with! You can watch this video for a trick on how to find out which scent pairs well with one another! If you want to make your own DIY perfume and making scent blends, check out this post. If you'd like to make a DIY reed diffuser check out this post from my friend Vanessa! 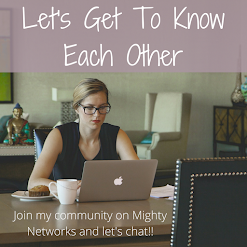 If you'd like to learn more about essential oils please join my Facebook group by filling out this form! It's a lot of funnnnn!! Did you know that it takes approximately 26 seconds for something that you apply to your skin to enter your blood stream? 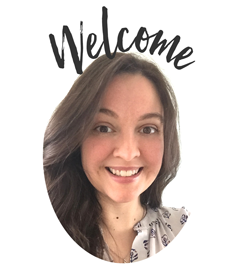 If you've been following my blog, then you know that my goal in life is to reduce chemical exposures for myself and my family. I've been making my own DIY products for cleaning and beauty for a few years and it's made a HUGE impact on my health and my skin. I had sensitive skin, but I've seen tremendous improvements from making my own products. However, one of the most common questions I receive is that people want to know what my exact skin care routine. Well, this is difficult because I don't really have a set routine. I listen to my skin and I do a variety of skin care treatments. To wash my face I use the oil cleansing method when my skin is dry, African black soap to control acne, and rosewater for normal skin but I add essential oils for acne, redness, or just to lightly wash my face. On some mornings, I will just wash my face with water. 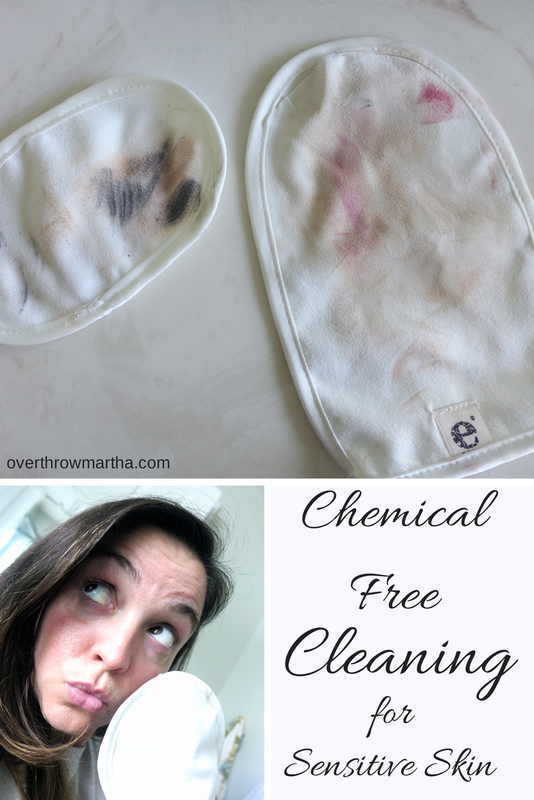 On those light cleaning days, I have to say that I think that the E-Cloth Facial Cleaning Mitt has been a big help! It is so gentle on the skin (it feels almost like satin) and it picks up dirt, makeup and any residue which make be clinging to my skin. When I first got it, I really couldn't believe how dirty it can be even when I've spent most of my day inside my office! But the best part is that it's chemical free!! 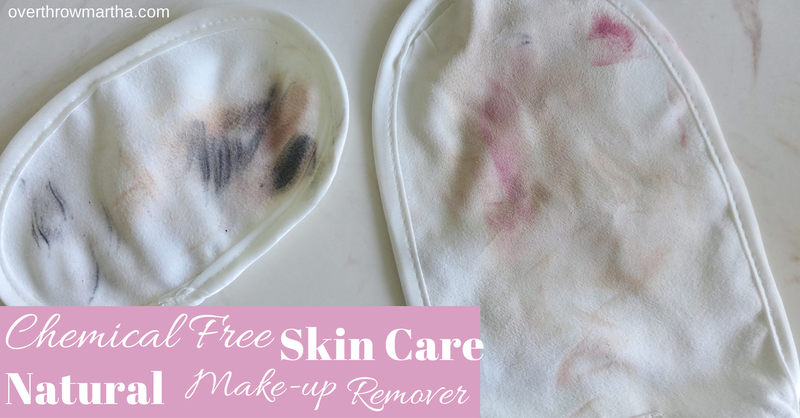 I use a small amount of my DIY facial cleansing solution or just water, then wipe it across my face. Simple!! I follow it up with Thayers Witch Hazel with Aloe Vera and some DIY Lavender and Rosehips moisturizer or a Rose Water Spray with just a little added vegetable glycerin as a moisturizer. After I wash, it's easy to wash it out with some warm water and let it air dry. After a few washes, just toss it in the washing machine and it'll be good to go again! Now are you ready for the fun part?! There is a GIVEAWAY!!! E-Cloth already knows I love their products. I've written a review about their cleaning products (seriously-- amazing!) and I've been using several of their other products for months so when they contacted me with an opportunity for a giveaway I jump on it! How cool is this! 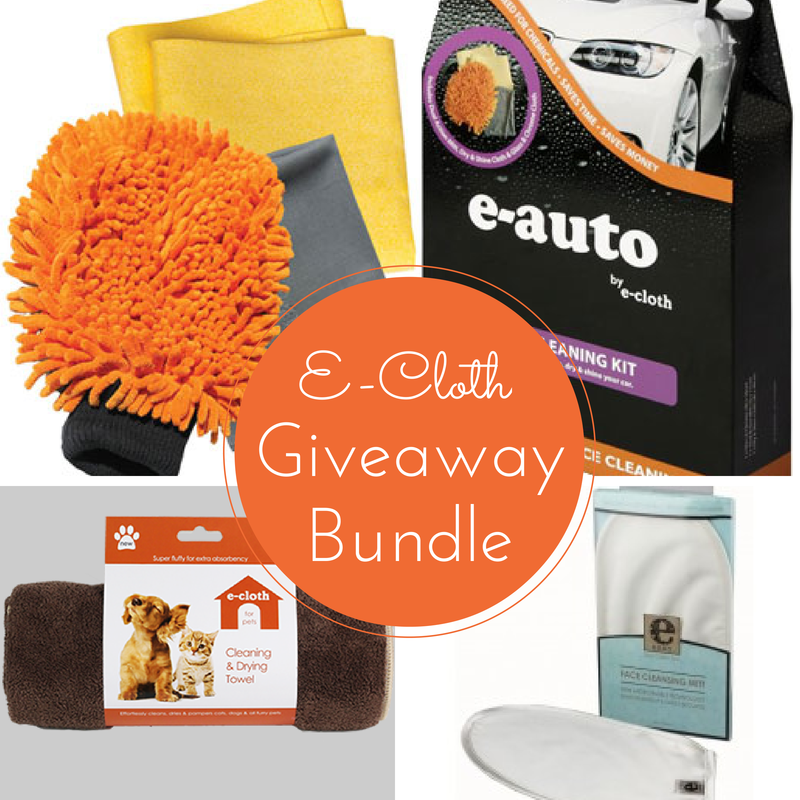 You get a bunch of great e-cloth products! This giveaway is for US residents only. The giveaway is sponsored by E-Cloth, but I was not paid for this review I just looooooove E-Cloth!